The August 25, 2012, Big Bear Classic Boat Show had a wonderful selection of old classic boats on display. 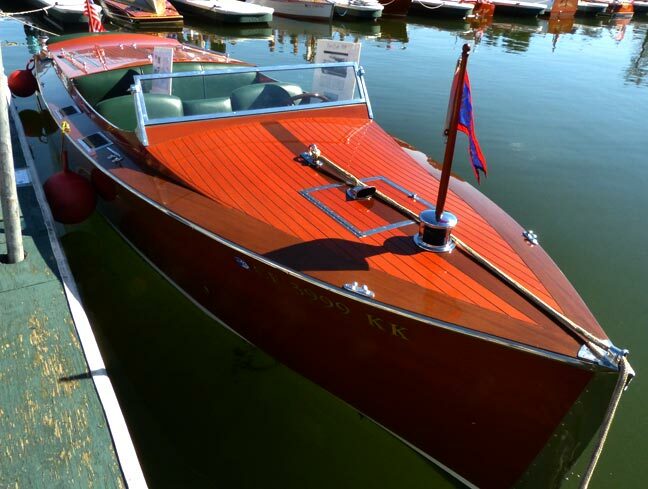 One in particular was a beautifully restored 26‘ Chris Craft named “Step In Again 1”. Sixty years ago, this boat was a familiar site on Big Bear Lake. It was part of a fleet of four “Step In Again” high performance tour boats that operated on the lake from the late 1930’s through the early 1950’s. “Step In Again One” was the most powerful, and fastest boat in this small fleet. What made it so unique, was that it was powered by a huge 500 hp Allison aircraft engine. Charley Stillwell, of the once popular Stillwell’s Resort, loved driving this boat. In order to maintain “Step In Again One’s” reputation as the fastest boat on the lake, he was always anxious to take on any comers who wanted to race . One of the boats from the “Step In Again” fleet makes a high speed pass in front of the old Stillwell’s resort. – Rick Keppler collection. The old Stillwell’s Resort, was located on the point on the lake near the village where B’s Backyard BBQ is today. 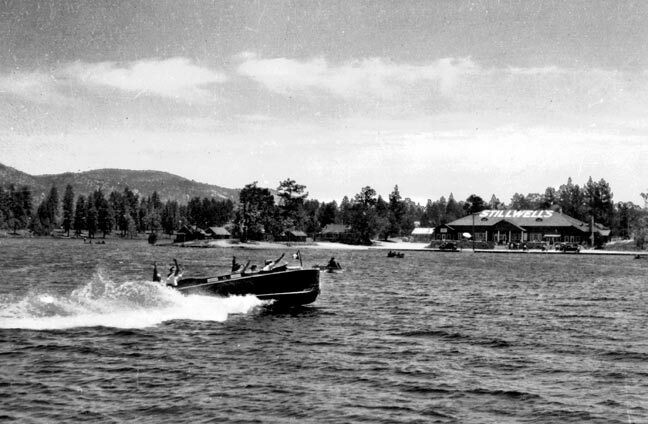 From the 1920’s through the mid 1940’s, Stillwell’s was one of the most expensive lake front resorts in Big Bear. Additional photos and history of this once fabulous lodge can be found on this website. As a boy, the “Step In Again 1” boat was also the favorite of our very own Channel-6 host of the Friday Good Day Big Bear show, Noel Blanc. As a boy, Noel would show up early in the morning at the marina, and fill the massive gas tanks of this boat before it would take to the lake for another day of giving thrill rides to tourists for $3 per person. 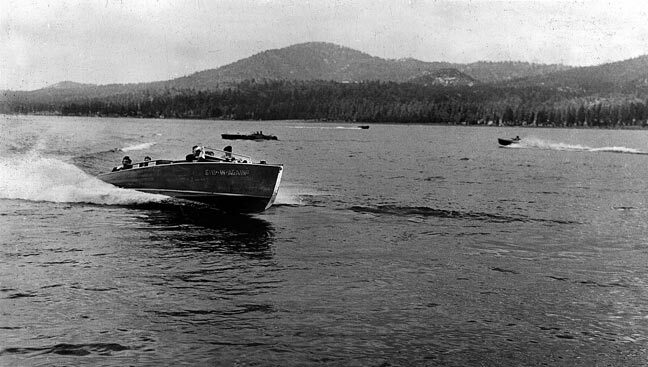 “Step In Again 2” cruising Big Bear Lake in the 1940’s. – Rick Keppler collection. Recently Noel Blanc told us the story of the last time Step In Again 1 was seen on Big Bear Lake. It was about 1949, when young Noel was a passenger on a typical high speed run down the lake. (This was years before Big Bear Lake had a maximum speed limit.) After returning to the Marina for another group of passengers, “Step In Again 1” left for another run down the lake, but this time it didn’t come back. It had made it almost all the way to the dam before it blew its powerful engine, sending one of it’s massive pistons through the mahogany side of the boat. Still afloat, the damaged boat was towed back to Pine Knot marina where it sat in storage for years. Then in the 1950’s, Step In Again 1 was hauled down to Long Beach, repaired, and put back to work again, giving sight seeing rides; this time at the Magnolia Pier “The Pike” until it was finally retired, and eventually disappeared. Now, over sixty years later, local Big Bear historians and long time residents Cap and Barbara Peckham managed to track down this historic boat, and bring it back to Big Bear. The next time you happen to be out on the lake, keep your eyes open. 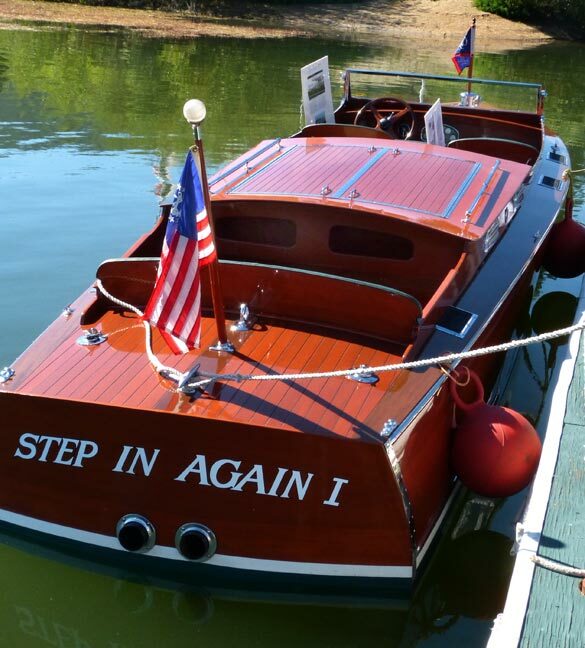 Thanks to the efforts of Cap and Barbara, Step In Again 1 is now beautifully restored, and once again cruising the waters of Big Bear Lake. Front view of the restored “Step In Again 1” Chris Craft at the 2012 Classic Boat Show. © Rick Keppler. 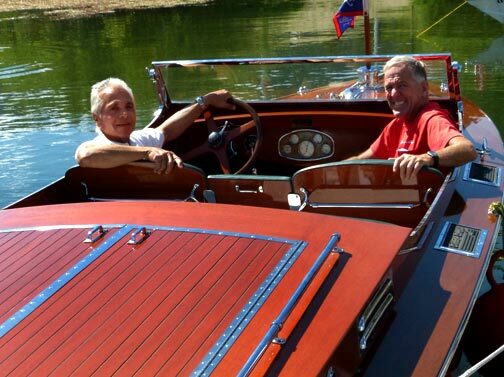 Noel Blanc (left) with owner Cap Peckham (right) relax in the restored “Step In Again 1” at the Big Bear Lake Classic Boat Show. A Bit Of Trivia: Noel Blanc was on the second to last run that this boat made, before it was pulled from Big Bear Lake, back in the late 1940’s. Noel was also on board “Step In Again 1” for the second run on the lake when owners Cap and Barbara Peckham returned it to Big Bear over 60 years later. © Rick Keppler.